[S25] Hannah McPherson, Holcombe Genealogy, Page 184.2, Item A-8-1-6-8-5-2-3. [S25] Hannah McPherson, Holcombe Genealogy, Page 184/Item A-8-1-6-8-7. Asahel Holcombe was also known as Ashbel Holcombe. He was born in 1786 at Granby, Hartford Co., CT. He was the son of Daniel Holcombe and Hannah Gillett. Asahel Holcombe married Lucy Holcombe, daughter of Elijah Holcombe and Lucy Holcombe, on 20 February 1810 at Granby, Hartford Co., CT. Asahel Holcombe died on 26 May 1841. 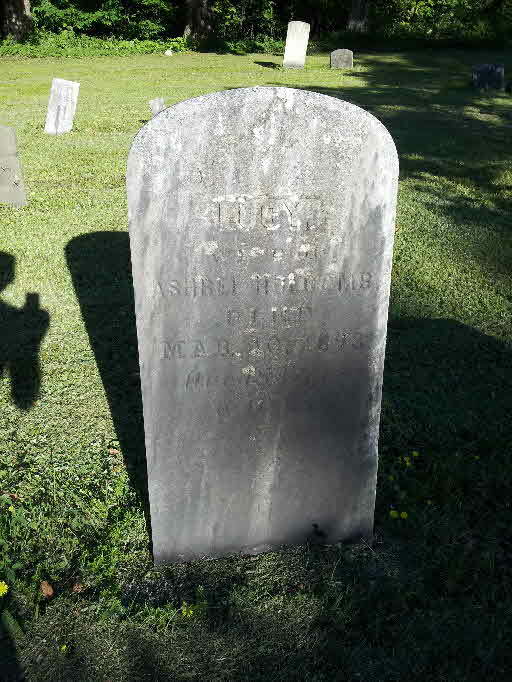 He was buried on 28 May 1841 at New Ohio Cemetery, North Colesville, Broome Co., NY. Served as a private in Captain Isaac Phelps, Jr.'s Co., of Connecticut Militia (War of 1812). This is probably the Asahel listed in "Connecticut Pensioners of 1835" listed as from Hartford Co., Private. The 1840 and 1830 Census' show him in Colesville, Broome Co., NY. Lucy was enumerated in the 1850 Colesville, Broome Co., NY, federal census, page 27, with daughter Lucy Ann. They were living next door to Edwin. [S25] Hannah McPherson, Holcombe Genealogy, Page 185.1/Item A-8-1-6-8-8. Lucy Holcombe was born on 25 May 1789 at Southwick, Hampden Co., MA. She was the daughter of Elijah Holcombe and Lucy Holcombe. Lucy Holcombe married Asahel Holcombe, son of Daniel Holcombe and Hannah Gillett, on 20 February 1810 at Granby, Hartford Co., CT. Lucy Holcombe died on 16 March 1873 at age 83. [S23] Jesse Seaver, The Holcomb(e) Genealogy, Pages 45, 77. [S25] Hannah McPherson, Holcombe Genealogy, Page 115.1/Item A-1-1-9-1-4. Carlos Holcombe was born on 25 February 1793 at Granby, Hartford Co., CT. He was the son of Daniel Holcombe and Hannah Gillett. Carlos Holcombe married Mercy Hayes, daughter of Dudley Hayes, say 1815. Carlos Holcombe married Charlotte Pope. 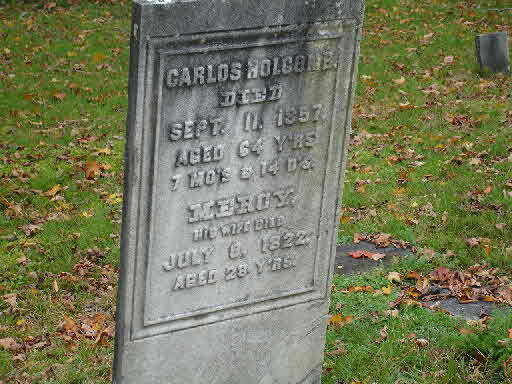 Carlos Holcombe died on 11 September 1857 at NY at age 64. He was buried at New Ohio Cemetery, North Colesville, Broome Co., NY. It is probably Carlos enumerated in the 1840 Colesville, Broome Co., NY, federal census as "C" Holcomb. There was one male 15-20, one male 20-30, and one male 40-50; there were 2 females under 5, 2 5-10, 2 10-15, one 15-20, and one 30-40. Carlos and Charlotte were enumerated in the 1850 federal census of Colesville, Broome Co., NY p 145/6 & 146, dwelling 213, family 219, lines 37-42 and 1-3; National Archives micofilm M432, roll 477, microfilm number M432-477. He was 51, she was 48. Children in the household were Cassandra 23, Charlotte 18, Almira 15, Eliza V. 12, N. Eugene 10, Chancy L. 8, and Ellen J. 4. 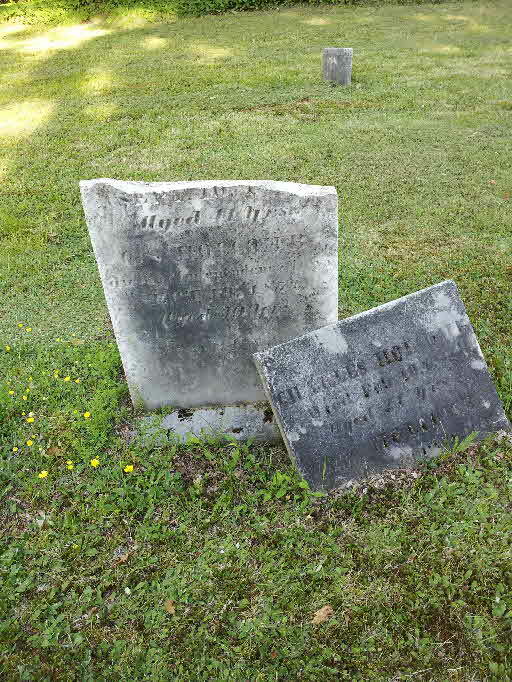 There is a tombstone in the New Ohio Cemetery with three names on it. It is probable that they are brothers. Based on the 1840 census, they could be sons of Carlos. They were: Charles who died 10 Febuary 1841 age 24, N.S. who died in Denver City 10 September 18-- age 41, and C.S. who died in Independence Iowa 19 September 1872 age 30. [S25] Hannah McPherson, Holcombe Genealogy, Page 183. Mercy Hayes was born circa 1794. She was the daughter of Dudley Hayes. Mercy Hayes married Carlos Holcombe, son of Daniel Holcombe and Hannah Gillett, say 1815. Mercy Hayes died on 8 July 1822. She was buried at New Ohio Cemetery, North Colesville, Broome Co., NY. Horace Holcombe was born on 18 April 1795.1 He was the son of Daniel Holcombe and Hannah Gillett. Horace Holcombe married Julia Ann Gillet on 7 April 1814. Horace Holcombe died on 23 March 1833 at age 37. Moved to New Ohio, NY and married. Charles W. Holcombe was born in 1819 at New Ohio, NY. He was the son of Carlos Holcombe and Mercy Hayes. Charles W. Holcombe died on 19 February 1842. Edwin Smith Holcombe was born on 10 February 1814 at Granby, Hartford Co., CT. He was the son of Asahel Holcombe and Lucy Holcombe. Edwin Smith Holcombe married Asenath Colt Case, daughter of George Case and Mary Gates, on 1 February 1837 at New Ohio, NY. Edwin Smith Holcombe died on 20 March 1897 at New Ohio, Broome Co., NY, at age 83. Farmer. Was in Colesville, Broome Co., NY for the 1840-1870 censuses. Edwin and Asenath were recorded in the 1850 Colesville, Broome Co., NY, federal census, page 27. He was a farmer age 28, she was 24. Children in the household were Manda 10, Ellen 8, Sidney 4, and Sarah 1. Mother Lucy and sister Lucy Ann were enumerated next door. Edwin and Asenath were enumerated in the 1860 Colesville, Broome Co., NY, federal census, page 17 (stamped page 691). He was a farmer age 47, she was 44. Mother Lucy lived next door. Children in the household were Amanda 20, Ellen 17, Sidney 14, and Sarah 11. Edwin S. and Asenath were enumerated in the 1870 Colesville, Broome Co., NY, federal census. He was a farmer age 56, she was 54. Children in the household were Mandy 27, sidney 23, and Sarah 21. Also enumerated in the household were George 85 and Mary 84 Case. Living next door was mother Lucy, 79. Edwin and Asenath were enumerated in the 1875 Colesville, Broome Co., NY, state census. He was a farmer age 62, she was 59. The only child in the household was Amanda 34. Also in the household was Asenath's father George 90. [S67] 1850 Federal Census,, On-line Database, Microfilm Number M432-477 p. 145, family 199, dcwelling 204, lines 8-13. [S68] 1870 Federal Census, unknown repository address, Microfilm Number M593-906 p 28, dwelling 243, family 243, lines 12-19. [S25] Hannah McPherson, Holcombe Genealogy, Page 185.1/Item A-8-1-6-8-8-1. Asenath Colt Case was born on 26 April 1816 at Granby, Hartford Co., CT. She was the daughter of George Case and Mary Gates. Asenath Colt Case married Edwin Smith Holcombe, son of Asahel Holcombe and Lucy Holcombe, on 1 February 1837 at New Ohio, NY. Asenath Colt Case died on 13 July 1907 at Harpersville, Broome Co., NY, at age 91. [S101] Ruth Cost Duncan, John Case, Page 106/Item 264.iv. Information on Pluma's family is from the Doyle Genealogical Database at http://www.gentree.com/cgi-bin/igmget/n=Doyle?ID2970. Pluma Amanda Holcombe was born on 18 May 1840 at New Ohio, NY. She was the daughter of Edwin Smith Holcombe and Asenath Colt Case. Pluma Amanda Holcombe lived in September 1914 at Tunnel, Broome Co., NY. Mary Ellen Holcombe was born on 9 July 1842 at New Ohio, Broome Co., NY. She was the daughter of Edwin Smith Holcombe and Asenath Colt Case. Mary Ellen Holcombe married Isaac Anderson Hurlburt Jr., son of Isaac Anderson Hurlburt and Mary Parker, on 13 January 1860 at Colesville, Broome Co., NY. Mary Ellen Holcombe lived in 1922 at Pasadena, Los Angeles Co., CA. She died on 26 July 1926 at Altadena, Los Angeles Co., CA, at age 84. She was buried at New Ohio Cemetery, North Colesville, Broome Co., NY. 1850-1880, 1900 Censuses in Colesville, Broome Co., NY. Family bible of Isaac Anderson Hurlburt now (1984) owned by Ellen Egli, 76 Riverside Dr., Sidney, NY 13838. Children of Mary Ellen Holcombe and Isaac Anderson Hurlburt Jr.
[S25] Hannah McPherson, Holcombe Genealogy, Page 185.1/Item A-8-1-6-8-8-1-2. Isaac Anderson Hurlburt Jr. was born on 18 November 1833 at NY. He was the son of Isaac Anderson Hurlburt and Mary Parker. Isaac Anderson Hurlburt Jr. married Mary Ellen Holcombe, daughter of Edwin Smith Holcombe and Asenath Colt Case, on 13 January 1860 at Colesville, Broome Co., NY. Isaac Anderson Hurlburt Jr. died on 1 September 1898 at NY at age 64. He was buried at New Ohio Cemetery, North Colesville, Broome Co., NY. Sidney Smith Holcombe was born on 29 November 1845 at New Ohio, NY. He was the son of Edwin Smith Holcombe and Asenath Colt Case. Sidney Smith Holcombe married Jane McCullough circa 1870. Sidney Smith Holcombe died on 21 March 1921 at age 75. Sidney and Jane were enumerated in the 1875 Colesville, Broome Co., NY, state census. He was a farmer age 29, she was 27. Children in the household were Mary E. 3, George C. 2, and Edwin F. 1. His parents were enumerated next door. Sarah Maria Holcombe married Whitford Van Dusen. Sarah Maria Holcombe was born on 18 November 1848 at New Ohio, NY. She was the daughter of Edwin Smith Holcombe and Asenath Colt Case. 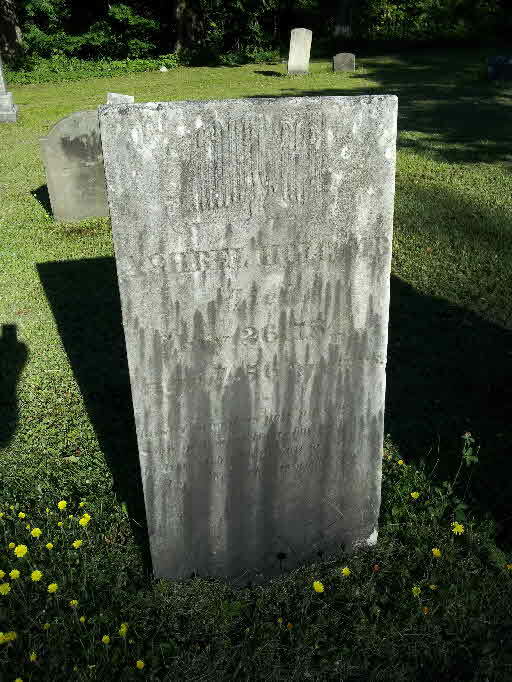 Sarah Maria Holcombe died on 7 April 1889 at age 40. 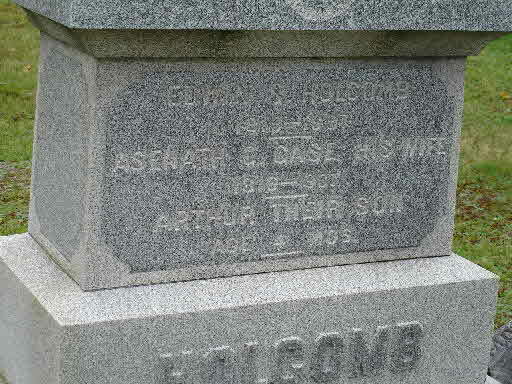 Monroe Holcombe was the son of Asahel Holcombe and Lucy Holcombe. Monroe Holcombe died at New Ohio, NY. Lucy Ann Holcombe was born on 26 May 1829 at NY. She was the daughter of Asahel Holcombe and Lucy Holcombe. Lucy Ann Holcombe married Malcolm Douglas Hurlburt on 3 October 1852 at New Ohio, NY. Lucy Ann Holcombe died on 3 March 1909 at age 79. [S23] Jesse Seaver, The Holcomb(e) Genealogy, Page 185. [S90] C.G. Hurlburt, Hurlburt Genealogy, Page 26. 1850-1860 Census in Colesville, Broome Co., NY. Also The Hurlbut Genealogy, or Record of the Descendants of Thomas Hurlbut, of Saybrook And Wethersfield, Conn., who came to America as early as the year 1637. With Notices of Others not Identified as his Descendants by Henry H. Hurlbut, Joel Munsell's Sons, Albany, NY, 1888, p238. Malcolm Douglas Hurlburt married Lucy Ann Holcombe, daughter of Asahel Holcombe and Lucy Holcombe, on 3 October 1852 at New Ohio, NY. [S45] Albert C. Bates, Simsbury, Page 243. [S25] Hannah McPherson, Holcombe Genealogy, Page 123.1/Item A-8-1-2-5. [S65] Deanna Holcomb Bowman Thomas Holcomb, Vol. I:Pg. 153/Item 8124. Asahel Hayes was born on 3 June 1732 at Simsbury, Hartford Co., CT. He was the son of Samuel Hayes and Elizabeth Willcockson. Asahel Hayes married Martha Holcombe, daughter of Lt. David Holcombe and Mehitable Buttolph, on 17 August 1749 at Simsbury, Hartford Co., CT.
[S55] Maude Pinney Kuhns, The MARY AND JOHN, Page 160. [S25] Hannah McPherson, Holcombe Genealogy, Page 119.2/Item A-8-1-2-1. [S65] Deanna Holcomb Bowman Thomas Holcomb, Vol. I:Pg. 254/Item 8126. Their descendants settled on Cash Creek in Ulster, Bradford County, PA in 1793. He was enterprising and early on erected a saw-mill on Cash Creek, which supplied the lumber for the first plank houses in a large section of the county. The saw-mill and corn-mill were in operation about 1795. Eli and Hannah had children listed in Simsbury Soldiers, Barbour records, and Barkhamstead records. I have a 1901 reunion report from Bradford County PA. In this document which covers several families, LeRoy and Ulster are in the center of this report. 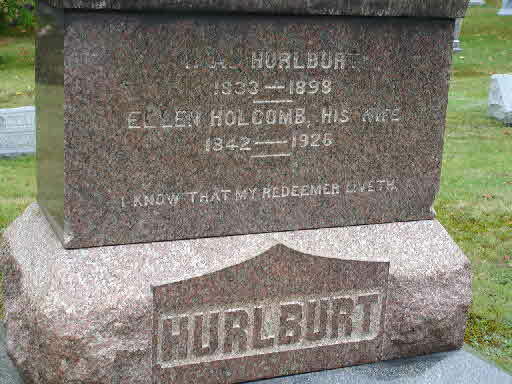 In the LeRoy, PA, grave yard there are many Holcombs from the Eli Holcomb family. Eli and Hannah Crofut Holcomb are buried in Ulster PA several miles away. I have visited Bradford county several times with my camera; several years ago a giant tree dropped on top of Eli and Hannah's graves and the stones are a mess. On a 10-speed bike ride from CT about 1973 I photographed the stones and Eli's DAR monument when they were upright and the tree was still there. The papers say that Eli took most of his family about 1793 (that part of PA was Connecticut's Western Reserve at that time) and settled there with Sterling, Hugh and many others. Eli served in 1775 and received a bounty coat, I have been trying to place him at Bunker Hill for his service in April-June 1775, a few months after Concord and the start of it all. Additional information on Eli's descendants is from Linda L. Mutzer, gmutzer@bellatantic.net. She cites, among other sources Pioneer and Patriot Families of Bradford Co. Pennsylvania 1770-1825 vols I and II, 1913 and 1915, Bradford Star Print, Towanda, PA.
[S65] Deanna Holcomb Bowman Thomas Holcomb, Vol. I:Pgs. 70, 156/Item 812b. [S23] Jesse Seaver, The Holcomb(e) Genealogy, Page 56/Item 219. [S104] DAR DAR Lineage book, Vol. LXXII:Pg. 3/Item 71005; Vol LXXIV:Pg. 41/Item 73104; Vol LXXXIV:Pg. 200/Item 83528; Vol CXVII/Item 116835; Vol. CXXVIII/Item 127064. [S25] Hannah McPherson, Holcombe Genealogy, Page 137.1/Item A-8-1-2-13. [S807] Find A Grave, online http://www.findagrave.com, Find A Grave, database and images (https://www.findagrave.com : accessed 13 April 2019), memorial page for Capt Eli Holcomb (2 Feb 1741–10 May 1823), Find A Grave Memorial no. 51548962, citing Ulster Cemetery, Ulster, Bradford County, Pennsylvania, USA ; Maintained by Lori (contributor 47185966) . [S65] Deanna Holcomb Bowman Thomas Holcomb, Vol. I:Pg. 154/Item 8127. [S25] Hannah McPherson, Holcombe Genealogy, Page 136.2/Item A-8-1-2-12. [S104] DAR DAR Lineage book, Vol. XXXVII:Pg 287/Item 36828; Vol LXV:Pgs. 273-4/Items 64783, 64784; Vol LXXIV:Pg. 142/Item 73375; Vol. LXXIX:Pg. 62/Item 78163; Vol. CIX:Pg. 211/Item 108703; Vol CXVII/Item 116173. [S65] Deanna Holcomb Bowman Thomas Holcomb, Vol. I:Pg. 155/Item 812a. From Carol Laun: Ezekiel was a veterinarian and Revolutionary War Vetran. He was married twice. He lived at 81 Petersen Road in Granby. The house was later torn down by his son James, who built a new house. This house was, in turn, rebuilt by Danish immigrant Peter Peterson in 1902. Proof of Ezekiel Holcomb’s first marriage to Elizabeth Gillet is found in her mother’s will dated 1805. Elizabeth (Hayes) Gillet left $1 to her grandson Ezekiel Holcomb Jr., the only grandchild mentioned in the will. Some of the information on the line of Ezekiel down to John Noble Holcombe is provided by Wadean Holcombe, 41997 Holcomb Rd., Richland, OR 97870; she cites a family bible held by Dale Holcombe in Bethpage, NY. [S65] Deanna Holcomb Bowman Thomas Holcomb, Vol. I:Pg. 70, 58, 155/Item 8120. [S25] Hannah McPherson, Holcombe Genealogy, Page 136.1/Item A-8-1-2-11. [S164] Carol Laun, Holcombe Collection, Page 1. Reuben Wetmore Holcombe was born on 11 May 1793. He was the son of Zephaniah Holcombe and Mehitable Wetmore. Reuben Wetmore Holcombe died in 1858. [S25] Hannah McPherson, Holcombe Genealogy, Page 39.2/Item A-4-2-10-5-11. Tryphenia Niles married Zephaniah Holcombe, son of Return Holcombe and Jerusha Adams, in 1772 at Columbia Co., NY. Tryphenia Niles died in 1777 at Columbia Co., NY. Mehitable Wetmore was born in 1759. She was the daughter of Reuben Wetmore and Hannah Foster. Mehitable Wetmore married Zephaniah Holcombe, son of Return Holcombe and Jerusha Adams, on 2 June 1779. Mehitable Wetmore died in September 1836 at Otseqo Co., NY. Abner J. Holcombe was born in 1815 at NY.1 He was the son of Reuben Wetmore Holcombe and Rebecca Niles. Abner J. Holcombe died in 1892. Abner J. and Martha were enumerated in the 1850 Huntington, Gallia Co., OH, federal census. He was a farmer age 36, she was 38. Children in the household were William W. 9, Orinda 7, Carson 5, and James B. 3. Abner's brother Reubin lived next door. Abner J. and Martha were enumerated in the 1860 Huntington Gallia Co., OH, federal census. He was a farmer age 45, she was 46. children in the household were Orinda 19, Carson, 18, and James 16. In the 1880 Huntington, Gallia Co., OH, federal census, Abner J. Holcombe, age 65, is married to Elizabeth R., age 58. Children in the household are James B. "26" and Brunetta Ward 3. Taphena Holcombe was born in 1818 at Gallia Co., OH. She was the daughter of Reuben Wetmore Holcombe and Rebecca Niles. Taphena Holcombe married Andrew Ewing, son of William Ewing and Mary McNeill, on 16 February 1839 at Gallia Co., OH. Taphena Holcombe died in 1889 at Harrison Co., IA. Information on only 7 of their reported 15 children were found. The first 7 children are accounted for in the census, but only the first 4 were recorded in the Family Bible. One child, Gabriel, died when he was 2. There was a 5/6 year gap between Sarah and Reuben. It is recorded that on 25 March 1839, Andrew bought 73 acres in Section 6, Vinton County, Ohio when it was still in Gallia County. The n.w. 1/4 of the n.w. 1/4, Township 8 - Wilkesville, from the Ohio Company. In the 1840 census Andrew and Taphena were in Wilkesville Township, Gallia County, Ohio. In 1850 they were still in Wilkesville Township but now it was in Vinton County. Andrew was a farmer and his mother, Mary - age 84 (actually 79 year old) was living with them. They were in Iowa in 1853 where his sister and family, the Dodrills, were living and they were in Missouri before 1858. In the 1860 census, the family was living in Summersett Township, Mercer County, Missouri. Andrew was farming. In 1870 they were in South Fork Township, Wayne County, Iowa, a farmer with grandson Andrew BYXBE, age 7, living with them. The 1880 census showed the family in South Fork Township, Wayne County, Iowa. Andrew was 71 years old and "infirmed." Rebecca, son Reuben and two granddaughters, Mary E. and Taphena J. ROGERS were with them. [S356] Nancy Hanks Ewing compiled by Barbara Ewing Powell James Ewing, Book 2, Volume 2. Amos Niles Holcombe was born on 30 December 1818 at Gallia Co., OH. He was the son of Reuben Wetmore Holcombe and Rebecca Niles. Amos Niles Holcombe married Martha Wilds on 26 December 1838 at Gallia Co., OH.1 Amos Niles Holcombe married Lovina Brownley on 20 November 1863. Amos Niles Holcombe died in 1895. He was buried at Ferguson Cemetery, near Lester Praire, MN. Family history states that John Wilds opened the first coal mine in West Virginia. This family moved to McLeod County, Minnesota from Ohio in 1872. Martha Wilds married Amos Niles Holcombe, son of Reuben Wetmore Holcombe and Rebecca Niles, on 26 December 1838 at Gallia Co., OH.1 Martha Wilds died on 20 October 1862 at Jackson Co., OH. Lovina Brownley married Amos Niles Holcombe, son of Reuben Wetmore Holcombe and Rebecca Niles, on 20 November 1863. Amanda Holcombe was the daughter of Reuben Wetmore Holcombe and Rebecca Niles. Mehitable Holcombe was born on 5 March 1822 at Gallia Co., OH. She was the daughter of Reuben Wetmore Holcombe and Rebecca Niles. Mehitable Holcombe married Enoch Russell Dickerson on 15 August 1840 at Huntington Twp., Gallia Co., OH. Russell and Esther were enumerated in the 1850 Huntington, Gallia Co., OH, federal census. He was a farmer, age 26, she was 28. Children in the household were Reuben 7, John 5, and alexander 1. E. Russell and Hetty were enumerated in the 1860 Huntington, Gallia Co., OH, federal census. He was a farmer age 36, she was 40. Children in the household were reuben 16, John 14, Thomas 12, Rebecca 3, and Enoch 2 months. Enoch R. and Mehatable were enumerated in the 1870 Huntington, Gallia Co., OH, federal census. He was a farmer age 46, she was 47. Children in the household were Rebeca 13, Enoch 10, and Sarah A. 6. Enoch and Mehitable were enumerated in the 1880 Huntington, Gallia Co., OH, federal census. He was a farmer, age 57, she was 58. Children in the household were Enoch R. 20, Anna 15 and grandsons Charles M. 13, and Amanul 12. Enoch Russell Dickerson was born on 5 September 1822 at Jackson Co., OH. He married Mehitable Holcombe, daughter of Reuben Wetmore Holcombe and Rebecca Niles, on 15 August 1840 at Huntington Twp., Gallia Co., OH. ENOCH R. DICKERSON is the son of John and Mary (Russell) Dickerson both of whom are deceased. Enoch was born in Jackson County, September 5, 1822. Mahettable Holcomb became the wife of Mr. Dickerson in Huntington Township, August 15, 1840. She was born in this county March 5, 1822. They have the following children: Reuben H., November 17, 1841, deceased; John W., February 14, 1844, deceased; Thomas A., May 31, 1849, resides in Hamden, Ohio; Niles N., April 22, 1851, deceased; Riley R., August 22, 1853, deceased; Rebecca, March 22, 1857, resides in Hamden, Ohio; Enoch R., April 9, 1860, resides in this county; Sarah Ann, July 10, 1863, resides at home. The parents of Mrs. Dickerson are Reuben W. and Rebecca (Niles) Holcomb, settlers of this county in 1811. The oldest son of Mr. Dickerson, Reuben H., enlisted in Company H, 27th Ohio Volunteer Infantry in 1862. He served about six months and was discharged for disability. He reenlisted in 1864, was taken sick at Nashville and died the same year. John W., another son, enlisted January 23, 1864, and was discharged April 17, 1865 at Camp Dennison. He was wounded July 4, at the battle of Kenesaw Mountain. He was sent to the hospital, but was afterward sent home, where the wound caused his death. Mr. Dickerson was elected school director in 1855 for three years. He is a resident of Huntington Township, where he is engaged in farming. His postoffice address is Alico, Gallia County, Ohio. Sarah A. Holcombe was born in 1832. She was the daughter of Reuben Wetmore Holcombe and Rebecca Niles.